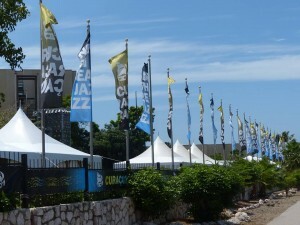 WILLEMSTAD - It is with great pleasure that the organization of the Curacao North Sea Jazz Festival can announce new names for the eighth edition, which takes place on 30 and 31 August and 1 September. Farruko had been added to the program on Thursday. Furthermore, Damian “Jr. Gong” Marley and Grace Jones are coming to the island this year. We can also announce performances by Patti LaBelle, KC & The Sunshine Band, Kamasi Washington and Burt Bacharach. Farruko, given name Carlos Efren Reyes, is a reggaeton and Latin pop singer from Puerto Rico. At the age of 16, he began to post his songs under his stage name to MySpace. To date, he has released six albums and has been nominated for Latin Grammy Awards several times. In 2017, he returned with his sixth studio album, Trapficante, a fusion of reggaeton and pop urban with Latin trap. Damian “Jr. Gong” Marley is the youngest son of Bob Marley; he was only two years old when his famous father died. Damian is nicknamed ‘Jr. Gong’, in honor of his father Bob aka ‘Tuff Gong’. Marley released his 4th studio album, titled Stony Hill, in July 2017. For the album he won his third consecutive Grammy Award for Best Reggae Album. Grace Jones redefined the eighties' pop and dance scene with hits like I’ve Seen That Face Before, La Vie En Rose, Pull Up To The Bumper, and Slave To The Rhythm. Although her latest album Hurricane stems from 2008, making it ten years old, Jones is hardly resting on her laurels. Last year, she played several European festivals and collaborated with British virtual band Gorillaz. Patti LaBelle, known as ‘The Godmother of Soul’, has sold more than 50 million records worldwide in a career that has spanned fifty years. LaBelle began her career as the lead singer of the vocal group Patti LaBelle and the Bluebelles. Following the group's name change to Labelle in the early 1970s, they released the iconic disco song Lady Marmalade which became a worldwide hit. Last year, Patti LaBelle released her first jazz album, Bel Hommage. KC and The Sunshine Band are an American disco and funk band named after its founder Harry Wayne Casey’s last name (KC) and their home state of Florida (‘the Sunshine state’). Starting out in 1973, the band became well-known for their numerous hit singles, among which That's the Way (I Like It), (Shake, Shake, Shake) Shake Your Booty, Keep It Comin' Love, Get Down Tonight, Please Don’t Go, and Give It Up. Saxophonist, composer, bandleader, and producer Kamasi Washington grew up in Los Angeles as the son of musical parents. He made a dream debut triple-album in 2015 with The Epic, which was incredibly well-received by critics. He also made a significant contribution to Kendrick Lamar’s highly successful album To Pimp A Butterfly. Washington is part of the West Coast Get Down, an L.A.-based influencial collective of jazz musicians. Virtually everyone in the world knows a song by Burt Bacharach, whether consciously or unconsciously. The master composer wrote the majority of his classics with lyricist Hal David. Songs like Walk On By, What The World Needs Now Is Love and I Say A Little Prayer are just a small sample from this living legend’s enormous repertoire.